So I had a bit of an ironic moment yesterday when out with the dogs in the mountains. After a day of exercise chasing boar around, I was leading the dogs down toward the car. 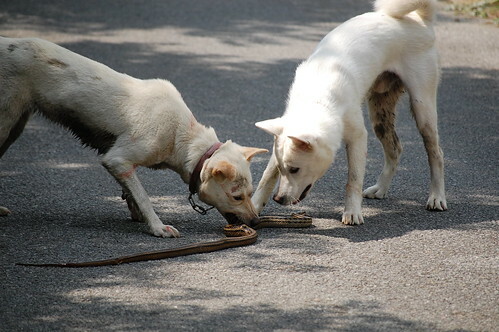 We just had a thread on the Nihon Ken Forum about snake proofing dogs the other day... Well Momo and Baron were walking just in front of me, and in about 5 seconds Momo had jumped into the grass, grabbed a snake, crushed its head, and killed it. Of course Baron thought Momo flailing the snake around looked fun, so came to see what was going on. Haru knows better. It was a non poisonous grass snake, but either way, it was over so fast I think that even if it was poisonous there was no hope for the snake. We had a nice walk through the mountains, the three dogs and my bro-in-law. Tried a bit of fishing afterward as well.